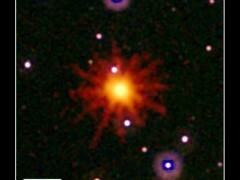 On March 28, 2011 Swift telescope detected a new X-ray and gamma ray source which has been given the name GRB 110328A. The source was found to be located at the center of a galaxy in the constellation of Draco situated about 3.8 billion light years away (z = 0.35). Seeing that the source continued its highly energetic activity even days afterward, astronomers began to realize that what they had been observing was something other than a mere gamma ray burst (GRB). Most gamma ray bursts, however, last only from a minute or so to several hours at most. This source has at the time of this posting been active for almost 4 weeks! As a result, what we may be witnessing for the first time is the onset of a galaxy core into the active quasar state. For more information on this read our posting in the superwave forum (GRB 110328A: First ever observation of a newly formed quasar! ).